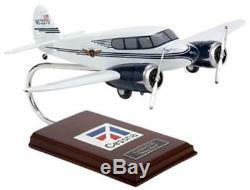 Executive Series Display 1/32 Scale Cessna T-50 Song Bird Private Solid Wood Resin Desk Top Display Model Airplane With Walnut And Metal Stand Item #H14932. Brand New In Foam Padded Box. Painstakingly built by skilled craftsmen, with a wealth of detail have hand-carved and hand-painted each model airplane, with great concern for exact accuracy. The model airplane measures approximately 16.50" in length and has a 14.00" wingspan. The item "Cessna T-50 Song Bird Desk Top Display Model Private Aircraft 1/32 ES Airplane" is in sale since Friday, November 23, 2018. This item is in the category "Collectibles\Transportation\Aviation\Other Aviation Collectibles". The seller is "bordi20" and is located in Fairfield, New Jersey. This item can be shipped worldwide.